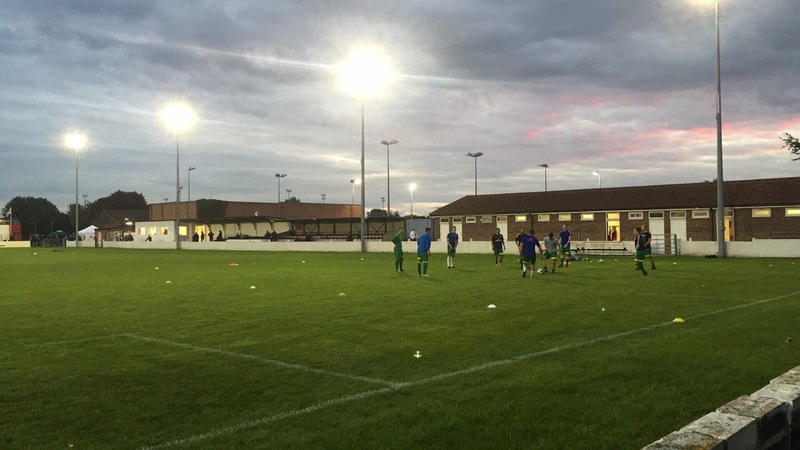 Wallingford Town FC was formed as a merger of Wallingford Town and Wallingford United in 1995. 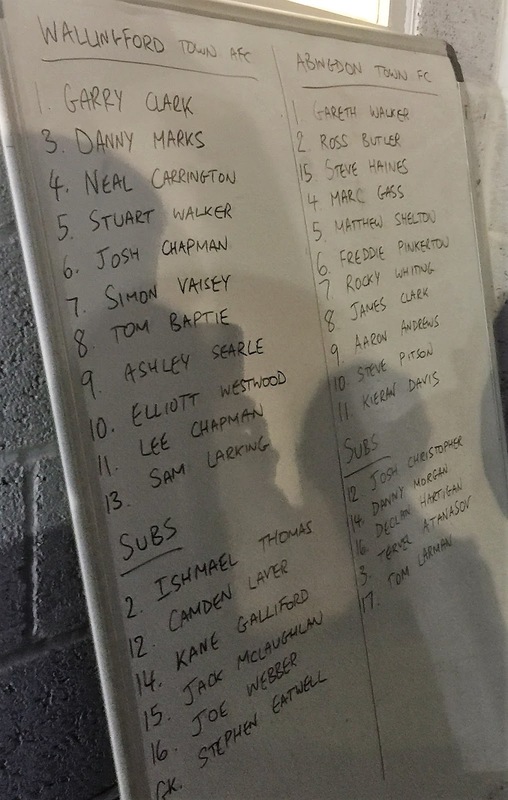 They were initially known as AFC Wallingford and had some great times around the turn of the century, even beating AFC Wimbledon to runners-up in the Combined Counties League in 2002/03. The previous season they had won the Premier Division and had another couple of runners-up positions. They had some good FA Cup runs during that period too, reaching the 2nd Qualifying Round on 3 occasions. 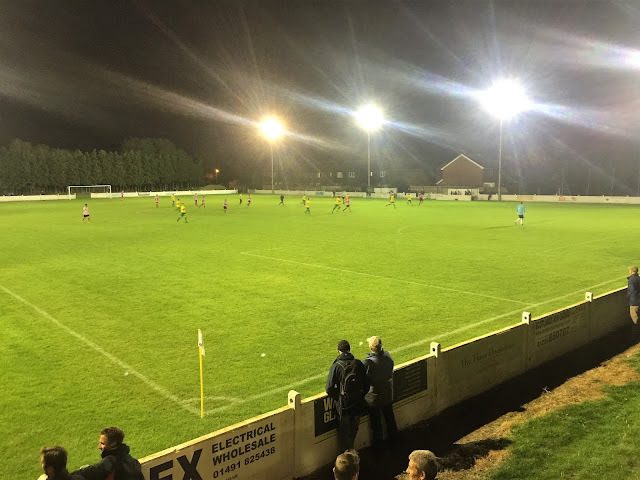 Geographical boundaries meant a switch to the Hellenic League in 2006 and a couple of years later, they opted to join the more local North Berkshire League. Since the switch, they have remained in Division 1, with a best finish of 4th coming in 2011. 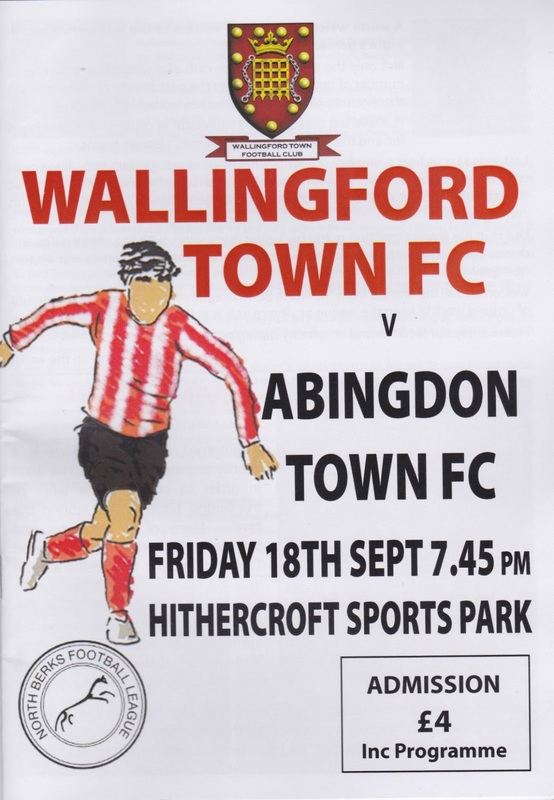 I'd originally tried to go to Wallingford Town around a year ago. They had organised a friendly against a team from Wales called Felinfach and were playing on a Friday night. But sadly around a week before the game, the Welshmen had to pull out due to not being able to raise a team, an understandable situation with most of them probably having full-time jobs, and the match scheduled for a Friday night. It was also a Friday night game on this occasion, as it was the opener to the North Berks League Hop, which was now in its 5th year. Last year the opener had been at Abingdon and had been a resounding success. While all that was going on I was in Felixstowe on the Eastern Counties League Hop. That was not such a success, with the plank of a referee calling the game off due to light fog, and the league officials nowhere to be seen, presumably stuffing their faces in the hospitality area. There had been a bit of ill feeling about them scheduling the hop at the same time as an established event and it had certainly cost their clubs, as the attendances were a lot smaller than what some excellent grounds, games and clubs merited. Unbelievably they had done it again this year, so I guess some people never learn the error of their ways. While I (and a lot of other hoppers) are not big fans of 'fields' there are plenty who would have liked to do both, yet are unable to do so because of poor scheduling on the ECL's part. On the day of the game I had my annual appointment at the heart clinic at the John Radcliffe Hospital in Oxford. The checkup turned out to be a complete waste of time as the clinic was running 45 minutes late, and all I did was speak to the doctor for 90 seconds which could have been done over the phone or by email. It cost me petrol all the way over to Oxford and back, plus a ridiculous £2.80 for 1 hour and 2 minutes parking. I came home and resumed my Football Manager 2015 career with Blyth Spartans, which had yielded an 11 game undefeated run before I went to sleep last night. I didn't quite carry on the unbeaten run, but I nabbed the last playoff final spot and won the semi-final before I had dinner and left at 5.45. I got to Anwar's at 6.10 and he was ready and waiting with his son Hicham. It was a pretty slow journey over there thanks to dawdling drivers, but 50 minutes later we were at the ground. Paying a very reasonable £4 to get in, including a programme, my first port of call was a double-decker bus that they had converted to a bar. I had a pint of Thatchers while I flicked through the programme. I then did the rounds chatting to various hoppers who I had met down the years before taking a seat in the stand with Anwar and his lad. It wasn't the best of games, though it started quite lively. The visitors had a goal disallowed on 5 minutes - a crossed free-kick was delivered into the box and the attacker headed in, but it was ruled out for offside. Apart from 2 great saves by the Wallingford keeper in the space of a minute, that was the sum total of the attacking intent for the first half. The winning goal for Abingdon came when a good through ball was played and the Abingdon number 10 finished cooly through the keeper's legs to get his side the win. There were half chances for both sides after that, but there never really looked to be any serious danger of another goal occurring. Though the game had not been the greatest, there had been a good friendly community vibe at the club and it had been good to catch up with people. After the game it was a much better journey home, dropping Anwar off shortly after 10 and getting home myself at 10.30. 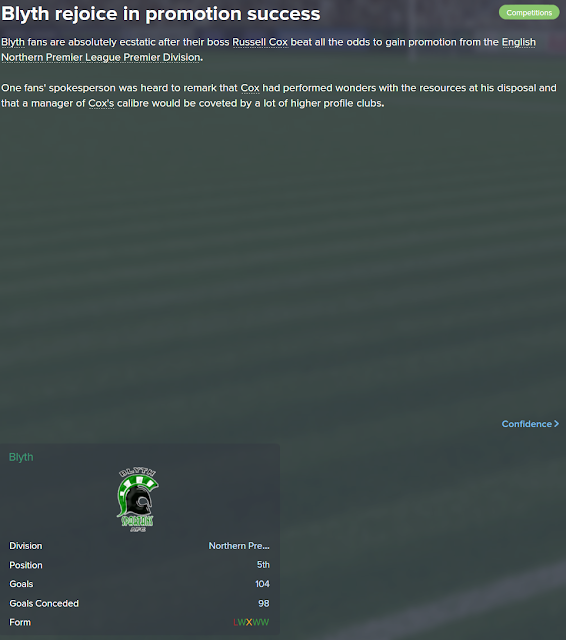 On FM15 North Ferriby were put to the sword and therefore I took them up to the Conference North. There was no civic reception or open-top bus ride, just a couple of cans of cider and a bedtime of 1am. HITHERCROFT is a former step 5 ground and it shows, as it would probably be good enough for step 4. All the covered accommodation is on one side in the form of 2 stands. Firstly there is an older stand, with very comfortable padded seats but supporting pillars which don't spoil the view that much unless you are unlucky. Then there is another arena type metal stand with bland styling and reasonable views. The rest of the ground is open flat standing. 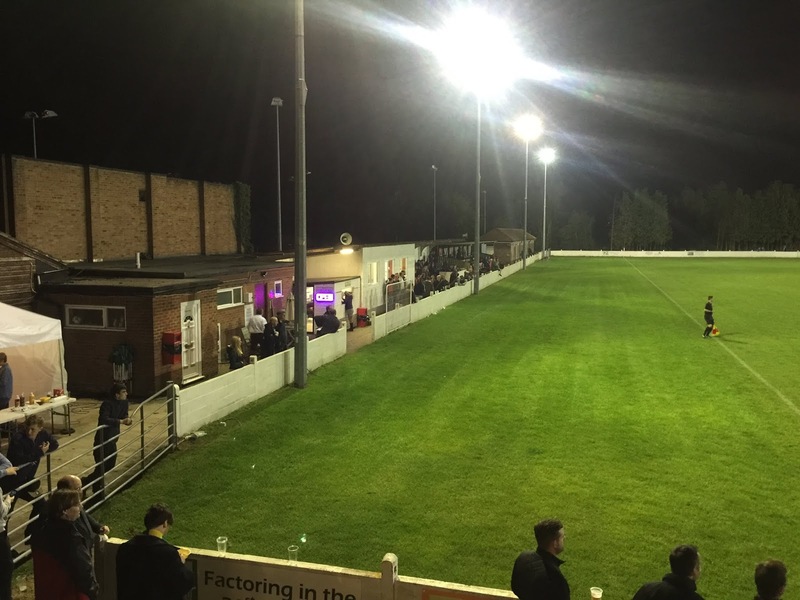 There is a unique bar at the ground - at least there was for the groundhop day. A double-decker bus had been converted into a bar and it had a few real ales plus a cider. Food was jacket potatoes when I went, and they also had small merchandise stall. Should you need a greater choice, the town is not too far away, though I never went so I can't say what it's like.